Following a Trail of Thoughts. Sometimes people visit this blog via a link from another website, and of course I like to pop over and see who sent them here. 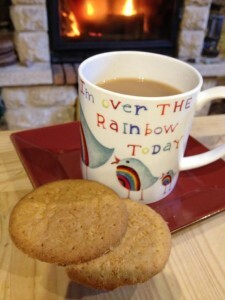 – Today I found myself at the blog of Mitzi, whose blog is Tea & Biscuits & A Good Book (and who can argue with that?) and who has just finished reading The Night Rainbow (in the bath). Sure enough, in her review Mitzi mentions that she had heard about The Night Rainbow last month from Jo, at her blog Through The Keyhole. I followed the trail, and in reading Jo’s post, I found that in her turn she had come to the book through recommendation, having heard about The Night Rainbow from Anna at the Green Tapestry blog, (a gardening and allotment notebook), who had written a post back in August talking about her summer holiday reading. I usually try not to read too many reviews, as I’m finding that what people have to say about a book that has been published somehow affects how I feel about the one I’m writing now. But as an author it was a joyful little moment, finding this organic trail of blog posts. It’s reassuring to see readers picking up on recommendations and passing them on in their turn, and a privilege to peek at the dialogue between the bloggers and the readers who leave comments. So my thanks to each of these three bloggers for sharing their thoughts, and to everyone who has taken the time to write a review or simply to tell others how you’ve enjoyed reading The Night Rainbow. After the brief burst of excitement over the launch of a book, I honestly believe it’s people like you who determine how it fares in the long run. If you’re interested in other blogs where you can find book recommendations, I did a series of interviews with book bloggers earlier this year. Start here and follow the trail! Thank you for mentioning my blog and linking. We certainly left a little trail there recommending The Night Rainbow, didn’t we? I tend to read lots of books through recommendations, you tend not to be disappointed in what you’re reading then. I really enjoyed The Night Rainbow so I hope that more of my readers will give it a go too.